In my time, I have reviewed some monstrous speakers. Whether this is as a result of my golden ears, or because I am big and ugly and can unpack big sound boxes, is moot. Some of the largest and most luxurious have been bipoles. This is when, seemingly just for the hell of it, a whole other set of speaker drivers are placed on the face of the speaker enclosure that is looking the opposite way. Mirage and Definitive technology are probably the two most famous brands that typically make big speakers in this fashion. The BPT5-10BL bipoles from Crystal acoustics are a bizarre animal by comparison, as they have a bipolar design (versus dipolar), while being affordably priced for a target audience of folks who want speakers to improve sound and complement their flatscreen TV, without dominating the room. Crystal acoustics, rather quaintly, calls it the 'plasma market'; I'm sure owners of LCD screens will appreciate the gloss black finish, too. 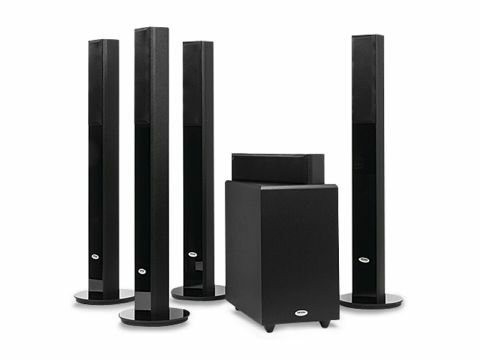 Petite and skinny, these towers arrive in a box of two pairs plus the centre speaker. There's little manual labour to do except screw the towers into their plinths. Thankfully, this only involves two screws per cabinet (no washers, no hex keys, no inexplicable bits of rubber), and they're light enough to lift one-handed. Having recently spent a good afternoon attaching another brand's speakers to their stands, this came as something of a relief. Completing this 5.1 array is the THX-10SUBT – a woofer way more potent than those described as ideal for partnering the system in the accompanying instruction leaflet. It's worth noting here that Crystal Acoustics doesn't have a UK distributor, so buyers order their speakers direct from the website. This cuts out the middleman, and results in a lower price point, but also means getting a demo before you get out your wallet is nigh-on impossible. Softening that blow somewhat is the brand's 60-day home trial policy. The slender towers are called BPT and the centre is termed LCR as, of course, Crystal Acoustics offers a variety of permutations and combinations of its products. so, you could use five of the smaller boxes and ignore the towers. But you'd lose the bipole sound. Just to prove I'm not a total multichannel nut, I did try the front pair on their own, with the bass removed as a 2.0 experiment upon setting up, and while the teeny weeny, alucone piston drivers are immensely rigid and do go in and out a long way for their size, it is still a three-incher and I was deeply underwhelmed. In fact, when I fired up the TV through it for a bit of Glastonbury, added the resident Pioneer LX-81 decoder and posh Acurus five-channel external amp just for stereo, my Panasonic TV's built-in speakers wiped the floor with them. Downcast, I spun up a Blu-ray. I'm still badly in the grip of Avatar and am learning the soundtrack a treat. And, on DTS-HD Master Audio, the point of this system finally became clear. As I'd guessed, the THX-guaranteed 10in subwoofer felt out of place – like a V8 lump in a shopping cart, it was wildly overpowered for the system. But the bipolar towers did a very clever thing indeed. The synergy created is excellent, with all those tiny three-inch drivers adding up to a very crisp midband with great definition and accuracy, honed by a lovely lack of power compression, every bit as tasty as when served up by Acoustic Energy-branded speakers. And, as long as the level isn't wicked up too far, they do this incredible, sweet yet diffuse-edged sound field. I had the towers' tweeters above my ear height on installation, and when our hero blunders off into the deadliest jungle within six light years of Terra, the sounds of Pandoran creatures were all around and above me. I was getting funny yipping noises to the extreme right-hand corner of the room, and the animals sounded like they were ranged into the distance, as well as close by. It was a deeper sound field than I'd expected for £650. It may have an ambitious design brief – with some huge limitations placed upon it by the diminutive 3in cones, so far as ultimate scale is concerned – but at sensible levels, Crystal acoustics' BPT5-10BL system delivers a real bipolar spread. And getting that from stuff this affordable and small is certainly an impressive achievement. Definitely worth considering if you have a small viewing room.